You'll received coupons and news each month via email. Come to Vincenzo’s for the best Italian pizza and cold beer in Santa Clarita Valley! 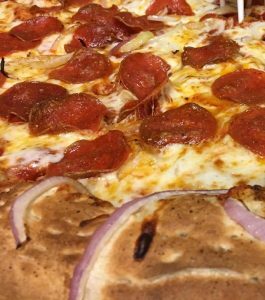 Our delicious, famous crust is hand-tossed and our pizza sauce is made fresh every day. We only use the freshest and most quality ingredients for our pizza and other menu creations. You can guarantee that all of our food is made fresh daily, and that our pizza delivery will be on time! Create your own meal combination or try one of our many pizzeria specials. Two Medium Pizzas– $35.95- Two 17” one topping pizzas. Individual Meal Deals– $8.95- A personal pan pizza with one topping of your choice and a fountain drink. $10.95- A personal pan pizza with one topping of your choice, green salad, and a fountain drink. Family Meal Deal– $34.95-One large one-topping pizza, two orders cheesy garlic bread, one large green salad, and one pitcher of soda (six pack of soda for delivery and carry-out orders).